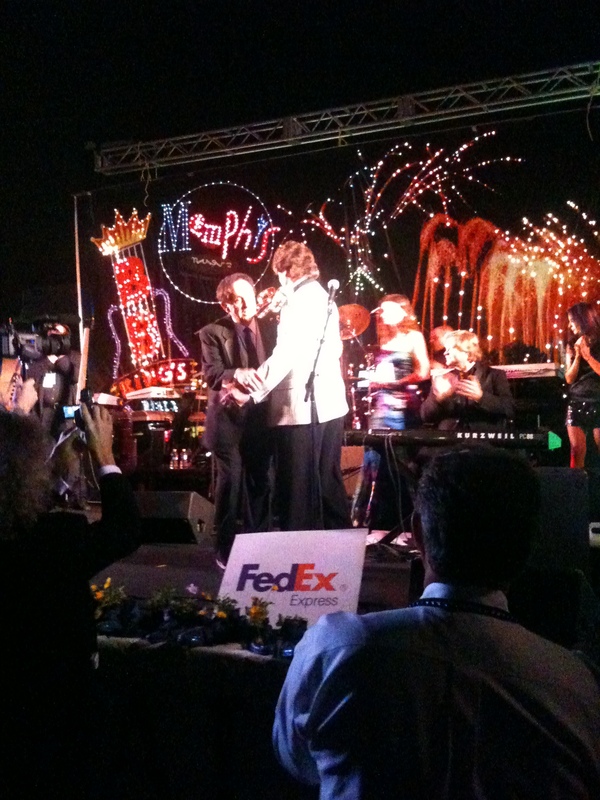 I attended the 17th annual Memphis Blues Ball last night, and it was fantastic. 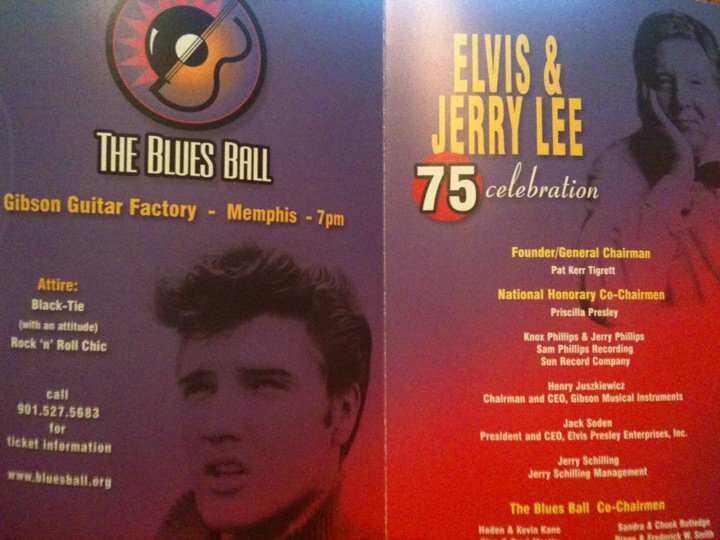 It was to honor both Elvis Presley, who would have been 75 this year, and Jerry Lee Lewis, who turned 75 this year. How could I miss this event? 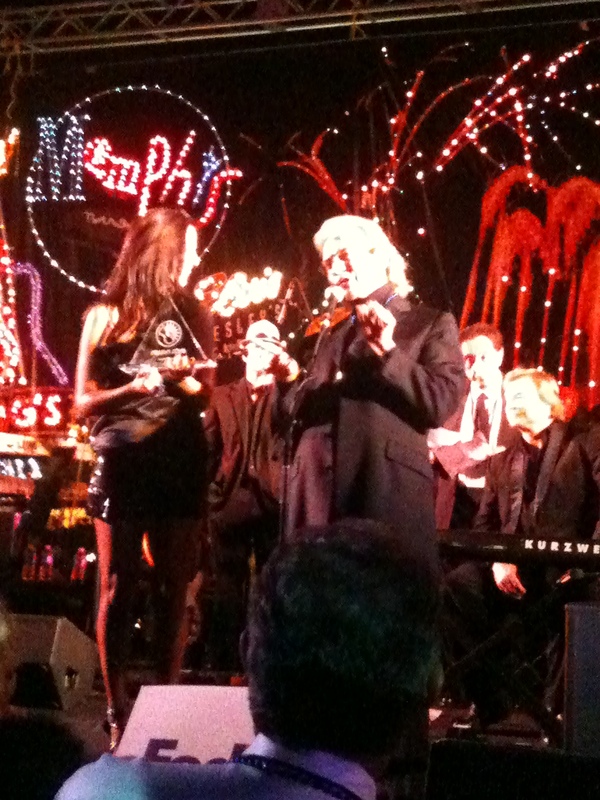 It’s for charity and Priscilla Presley and Jerry Schilling are on the board. I received my invitation a while ago, but was undecided until just the day before the Blues Ball but luckily I had been emailing back and forth with them, so they reserved a spot for me. Not sure what ‘black tie rock and roll chic’ was, but I put on a simple knee length black dress and was on my way. Luckily I was ok. 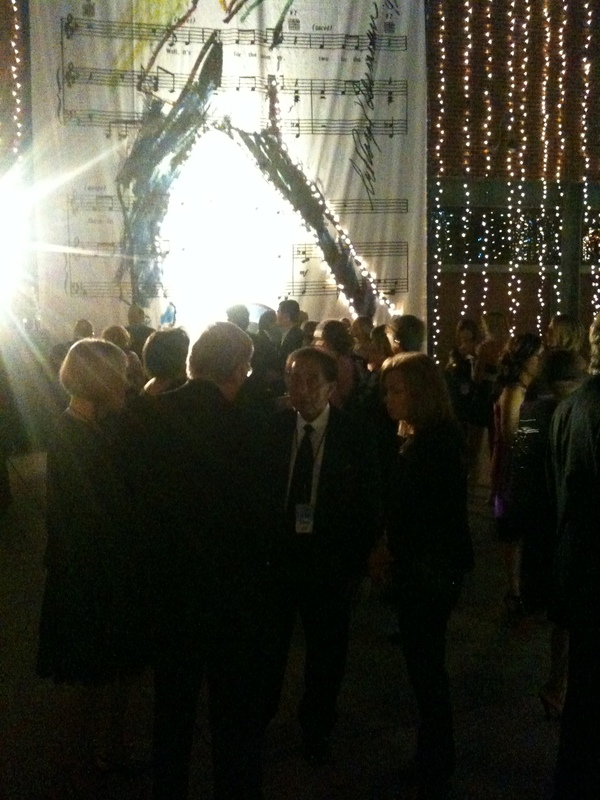 Some were in ball gowns, some were in pants, most were like me. I arrived just before 7pm and valeted my car (complimentary). 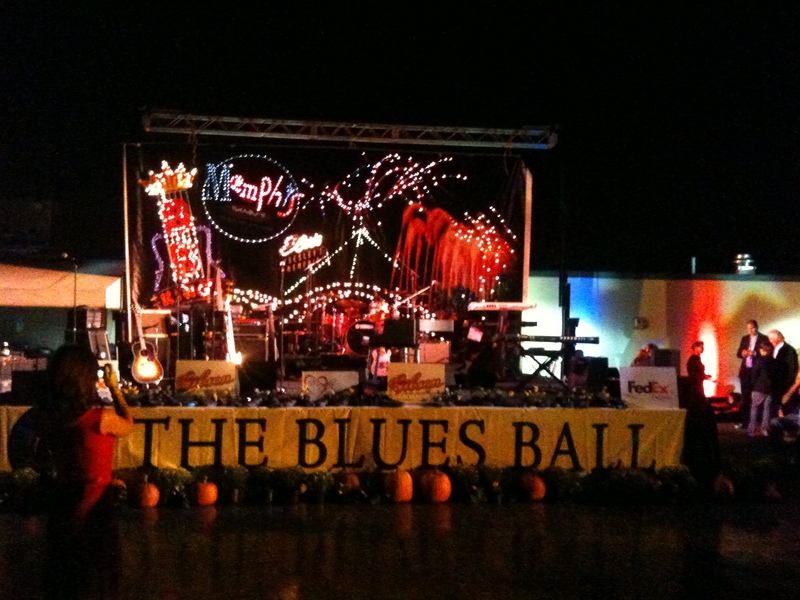 The first hour of the Blues Ball was outside the Gibson Guitar Factory. 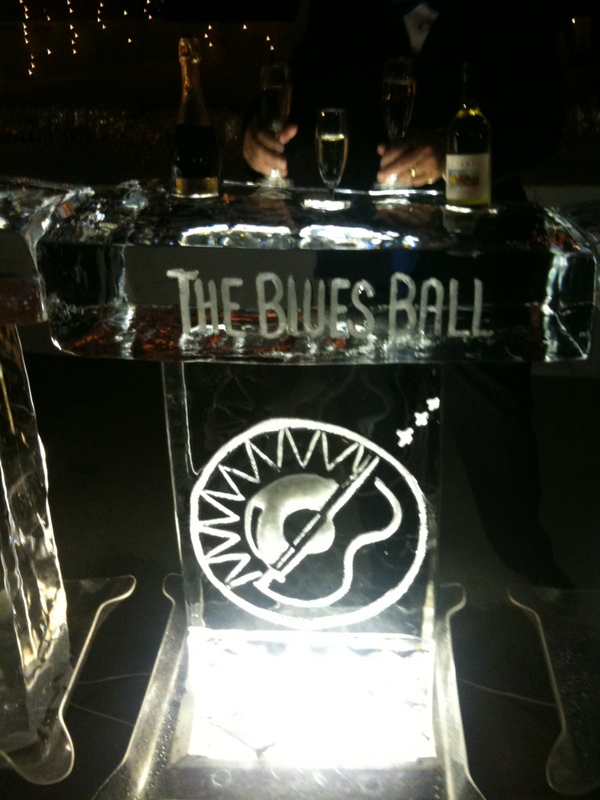 There was a fantastic ice sculpture bar serving white wine and champagne. After 2 glasses of wine, I thought I should slow down. 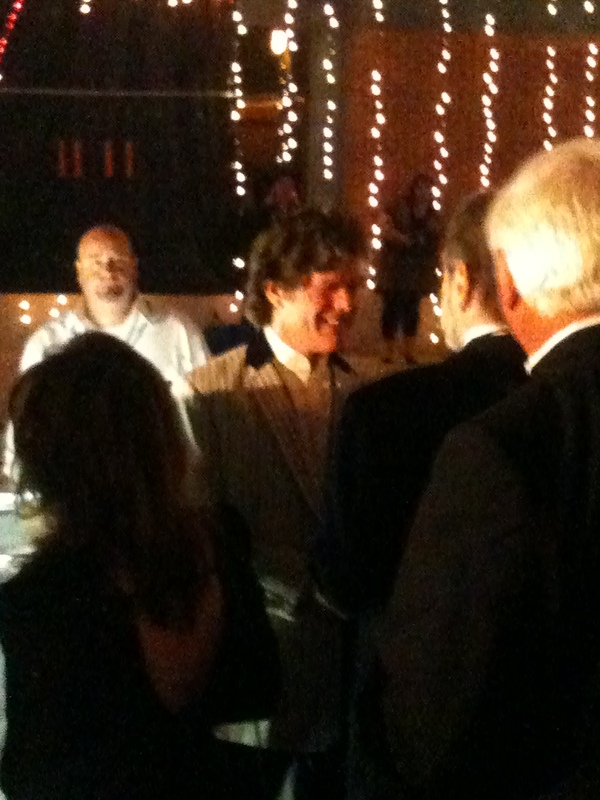 First to arrive of note was Mark James, who wrote ‘Suspicious Minds.’ Then in walks Knox Phillips, Sam Phillips’ son. Then Elvis’ best friend George Klein comes in. 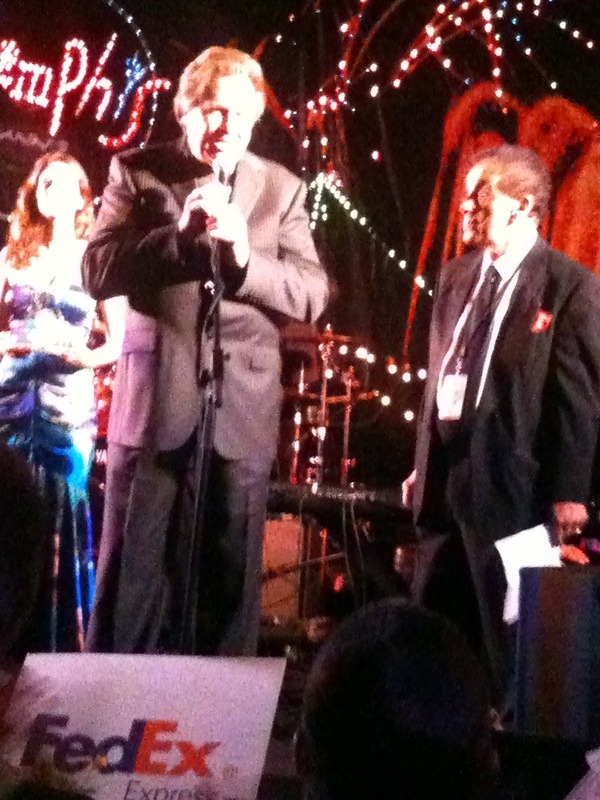 Then Elvis’ other best friend and my favorite Jerry Schilling arrives! 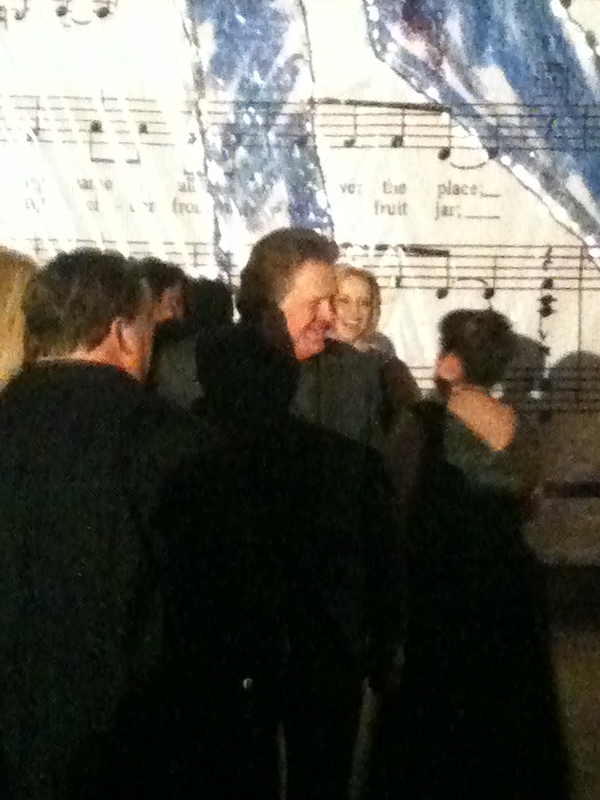 Then I really got excited and pretty much followed him around. I waited for Priscilla and Jerry Lee, but never did see them, which was fine because I had Jerry Schilling. 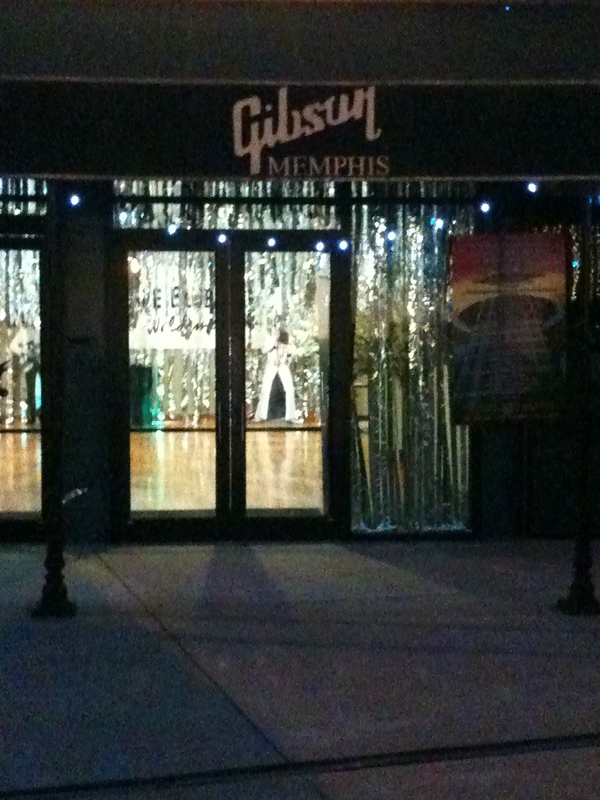 A little after 8pm, people started moving inside the Gibson. 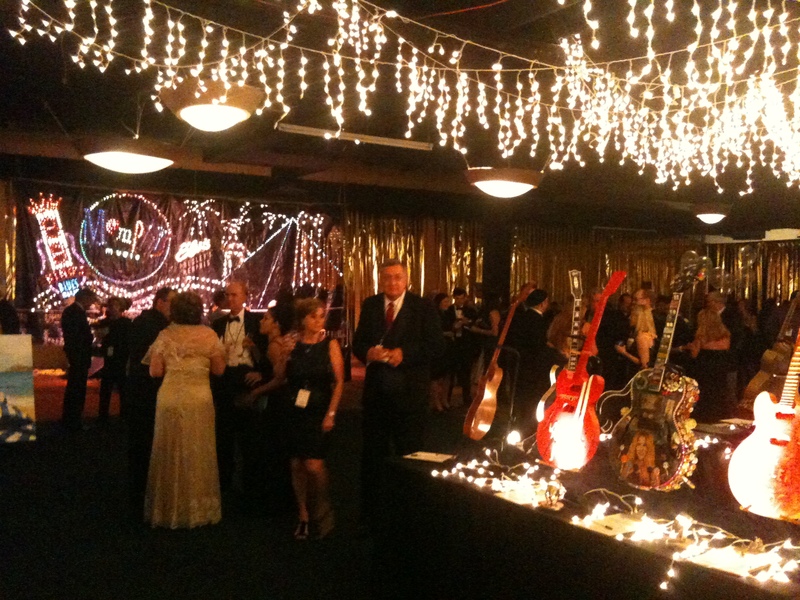 There was a room for the silent auction, a lot of painted guitars as well as hotel stays and Grizzlies tickets. I didn’t bid on anything. There was also a bar and some food. I didn’t drink anything here, but did try the spicy macaroni and cheese from Sole. Yum! Then a little while later, we moved up onto the roof where dinner was to be served and where the entertainment was. It was a great view of Fed Ex Forum, the Westin Hotel and Beale Street. My table was off to the side, but that was fine for dinner. After the National Anthem and Amazing Grace were played, dinner was served. I had some lively dinner companions. There was wine on the table, so I thought it was safe to have a glass with dinner – plus there was a bottle of water. Dinner was pork bbq, fried catfish, broccoli casserole and corn stuffing. The broccoli casserole and corn stuffing was really good. 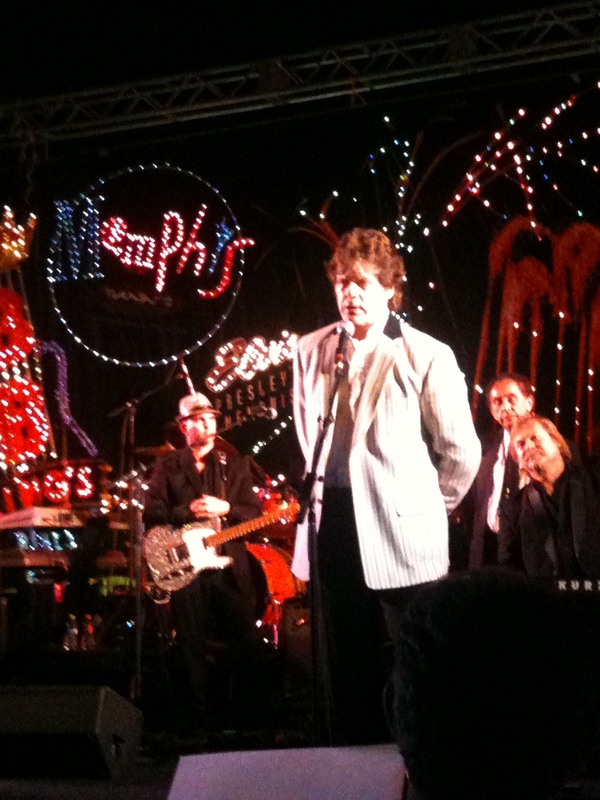 After dinner was served the entertainment began with Jason D Williams, basically Jerry Lee Lewis Jr. I decided to get up and walk around to get closer to the stage. And good thing I did because the awards ceremony started after Jason D Williams was finished. George Klein was the MC of the awards ceremony. Mark James, Knox Phillips and George Klein all received awards. Jerry Schilling introduced George Klein and gave him the lifetime achievement award, so I got a chance to take many pictures. 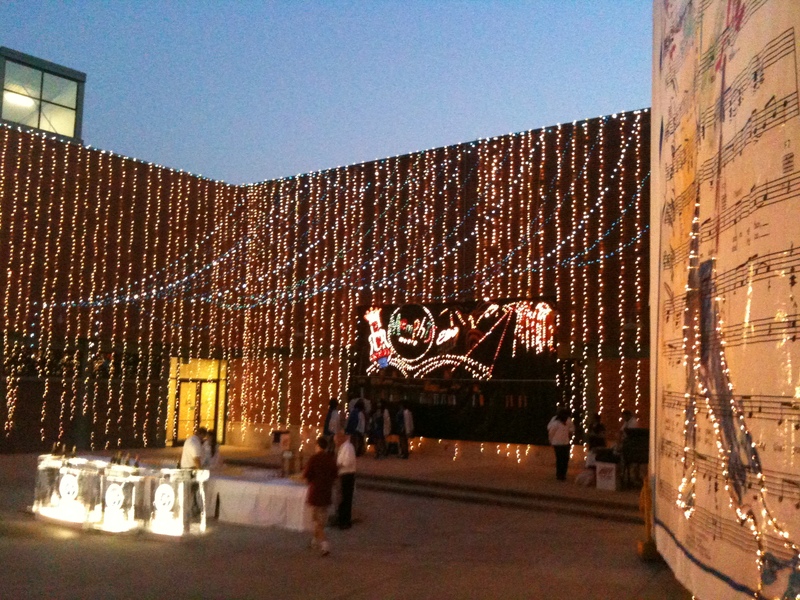 After the awards ceremony, there were fireworks and Ronny McDowell played, then I decided to leave. I waited at the valet with Jack Soden. I left around 10:30pm, and it was only 78 degrees. I love Fall in Memphis!